(Feb. 27, 2017) – After months of advocacy and planning by the Technology Association of Louisville Kentucky — which included an introduction to The National Integrated Cyber Education Research Center (NICERC), a grant-funded program of the Department of Homeland Security– the Kentucky Department of Education has officially approved and adopted the Cyber Engineering Pathway for all Kentucky school districts, which includes NICERC’s 9th thru 12th curricula. Jefferson County Public Schools (JCPS) will be the first school district in the state to officially roll out this cyber program in its first year to the classrooms at Central High School, Southern High School, Seneca High School, Eastern High School, Fairdale High School, and PRP High School. Some schools in 2017-2018 will start with a partial implementation of the pathway to begin. NICERC is headquartered in Louisiana but has a STEM, Cyber and Computer Science footprint in all 50 states in country. Kentucky follows Louisiana in leading the way to fulfilling a vision of both cyber career-ready and college-ready training for youth. “This Cyber Literacy curricula opens an academic path and career opportunities in cybersecurity. The demand for cybersecurity experts is growing 12 times faster than the current US job market, making cybersecurity one of the most highly sought-after careers in the country,” said Dawn Marie Yankeelov, Executive Director of TALK, the area’s tech council. She was quoting an-often discussed, federal statistic from the National Initiative for Cybersecurity Careers and Studies. 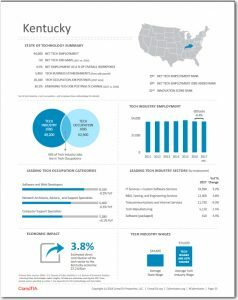 Kentucky alone had more than 2115 unfilled positions last year in cybersecurity. So important, to US corporate and governmental infrastructure, open cyber positions are now tracked, as of last year, as a website called Cyberseek by state. (www.cyberseek.org) “And, there is more good news for the students. The average reported salary for a cybersecurity salary is about $116,000,” Yankeelov added. “We immediately saw the value in this curricula and because it is a federally-developed pathway, the expense costs are lower, and the training is immediately available to our teachers,” said Scott U’Sellis, Information Technology & Media Arts Consultant at the Kentucky Department of Education. This summer NICERC, TALK and JCPS representatives will present to superintendents and teachers across the state at the Annual Kentucky Career & Technical Education Summer Conference (KACTE). There will be a 7-hour workshop presented by NICERC’s team of subject matter experts. “There are about 10 IT-related pathways for school districts in the state currently and this cyber curricula does not have to be taught only be computer science teachers,” U’Sellis said. 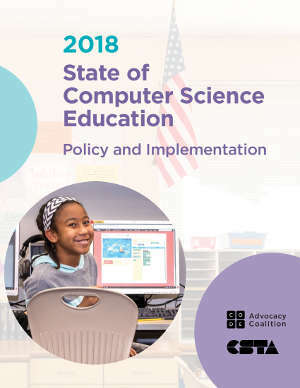 Other states are searching for approaches to teaching information technology subjects, but not the finer details of computer science. We are at the forefront on this here in our state. We are being proactive here and finding our way,” said U’Sellis. “JCPS immediately saw the value in bringing this to our high school population,” said Ryan Deal, Business and IT College and Career Readiness Specialist at JCPS. “NICERC is excited to work with The Kentucky Department of Education, TALK, and JCPS on this initiative and to cultivate an atmosphere of educational innovation in every K-12 Kentucky classroom. At its core, our mission is to develop a cyber workforce through the creation and enhancement of STEM and Cyber educational opportunities for both teachers and students,” says Kevin Nolten, Director of NICERC. This is the beginning of a great partnership, and TALK has opened the conversation across the state via the Tech Councils of America to other opportunities as well,” adds Nolten. TALK also invited Rodney Petersen, Director of the National Initiative for Cybersecurity Education (NICE), to present at the TECNA (Tech Councils of America) CEO Retreat in April of this year. To further this conversation regarding the importance of cybersecurity, TALK will host a Cybersecurity Summit for professionals and educators in state on June 15th from 9 AM to 4 PM with a cocktail hour at the Old Walnut Center Conference Center in Louisville this year, where Metro Louisville’s Gigabit Demo Center will be opened this spring. The National Integrated Cyber Education Research Center (NICERC) provides hands-on professional development, curricula, programs, and competitions to engage students in STEM and Cyber disciplines. Project-driven curricula creates a context for the content at every level of learning. Professional development programs for K-12 teachers enable them to motivate creativity and innovation in students through problem-solving, critical thinking, and communication. These initiatives offered through NICERC provide a collaborative and comprehensive solution that fosters systemic change in education. Funded through a grant by the Department of Homeland Security, NICERC offers its robust library of STEM, Cyber and Computer Science curricula to any K-12 educator at no cost. For more information, go to: www.NICERC.org. TALK stands for the Technology Association of Louisville Kentucky, and is one of 50+ tech councils in the US and Canada. The tech council mission is statewide workforce and economic development—in short, create jobs and train people. The goal is to create opportunities for job growth, job training, STEAM curriculum, plus public policy, and advocacy around technology subjects. The organization held its first meetup in February 2013 in Louisville, and is a registered 501C3. For more information, go to: www.talklou.com Technology Association of Louisville Kentucky can be found on Facebook, Linked In, and on Twitter @talklou.